There is a growing awareness of the severe damage caused by toxic pesticides to the environment and to public health. consumers are no longer prepared to put pesticide-treated agrcultural produce on their tables. This trend of reduced use of toxic materials will grow together with the legislation of new environment protection laws. Pests and insects cause immense damage to the yield by feeding on or sucking the plant, depositing eggs on the crop and spreading disease. Insects also develp resistance to chemical pesticides, resulting in a significant reduction in the efficiency of these materials. Nethouses: Light Weight frames with poles and cables that support the net. Greenhouses: Air Vents are covered with nets, or all the greenhouse walls are made of nets. Walk-in Tunnels: completely covered with net, or covered with net and PE sheets. Anti-insect nets block the penetration of insects and are differentiated by hole size (mesh=number of holes per inch).The type of net (mesh size) is selected according to the insect that is prevelent in the area. 17-mesh net: For protection against fruit files (Mediterranean fruit fly and Fig fruit fly) in orchards and vineyards,Grape moth and Pomegranate Deudorix livia. This net is also used for protection against climatic elements such as hail, wind and excess solar radiation. 25-mesh net: For protection against mediterranean fruit fly in peppers. 40-mest net: For partial blocking of white flies where climatic conditions do not allow the use of 50 mesh nets. 50-mesh net: For blocking white flies. aphids and leafminer. Also available in the color grey. 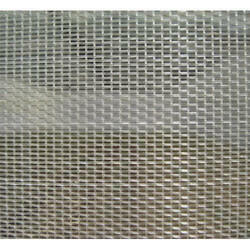 50-mesh net: The same use as 50mesh but with even more protection against white flies. aphids and leafminer. 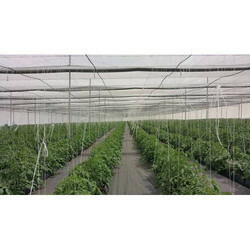 75-mesh net: For blocking whiteflies, aphids and thrips in greenhouse with forced-air systems. OptiNet is a sophisticated new-generation anti-insect net that integrates physical and optical protection. This innovative net dramatically reduces the number of pests and insects entering the crop environment, expecially thrips and also whitefly and leafminer. The net contains optical additives (non-toxic) that blind and repel the insects before they reach the net. Agriplast Insect Nets are made of high-quality virgin material and it comes in 40 mesh and 50 mesh size. These nets come with a guarantee of 5 Years against UV degradation. However, the actual life is more than 10 years in the field. Looking for Insect Nets ?